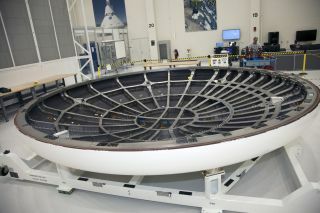 The heat shield for the Orion spacecraft is placed on a work stand inside the Operations and Checkout Building high bay at NASA’s Kennedy Space Center in Florida. NASA's Orion Multi-Purpose Crew Vehicle, the next-generation spacecraft that could be used for future manned missions to Mars, is less than a year away from its debut test launch in 2014. The test flight, known as Exploration Flight Test-1, or EFT-1, is scheduled to take place in September. The spacecraft will fly 3,600 miles (5,800 kilometers) above Earth, farther than any spacecraft built for humans has traveled since the Apollo 17 mission in 1972. The first Orion mission will be an uncrewed lunar flyby in 2017, returning to Earth’s atmosphere at 11 km/s ­– the fastest reentry ever. The spacecraft will orbit the planet twice before plunging through the atmosphere and splashing down in the Pacific Ocean, off the coast of California. The Orion capsule's heat shield, which will protect the spacecraft as it travels nearly 20,000 mph (32,000 km/h) through the atmosphere, was delivered earlier this month to NASA's Kennedy Space Center in Cape Canaveral, Fla., and engineers are now preparing for its installation. NASA officials said the heat shield, which will protect the Orion spacecraft from temperatures near 4,000 degrees Fahrenheit (2,200 degrees Celsius), is expected to be in place in the spring. The Delta IV Heavy Lift rocket that will be used for Orion’s first mission, Exploration Flight Test-1, is in the final assembly area at United Launch Alliance’s factory in Decatur, Ala. The spacecraft's three main parachutes were installed this month. The 300-lbmain chutes, which together could nearly cover a football field, were installed using a crane. A total of 11 parachutes will be used to slow the vehicle to less than 20 miles per hour (32 km/h), as it prepares to splash down in the ocean. The Delta 4 heavy-lift rocket that will be used to launch the Orion space capsule on its maiden test flight is also nearing completion at United Launch Alliance's facility in Decatur, Ala. The rocket is scheduled to be shipped to Florida in the spring, NASA officials said. If the first test flight goes well, the first full-scale unmanned flight is slated for 2017, during which the spacecraft will be launched atop NASA's new Space Launch System.